Made of Cowhide Leather with Reinforcement Palm in Gripy. Back in Kevler Knit Nomex with Silicone dot Printed Fabric. Back Knuckle Mold for more Protection. Neoprene Wrist with Hook and Loop Clousre Provides a Comfertable Fit For Superior Protection on jobs. Customize Logo and Custom Designs are being offered for Militery Gloves. We use best quality of leather or flexible abrasion resistant leather for Militery Gloves. 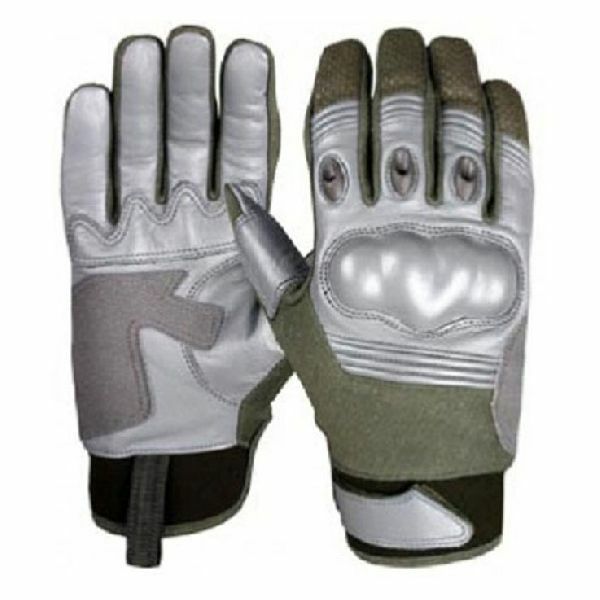 Militery Gloves are available in different colours as per customer's requirements. Militery Gloves is also Available with Lining (Fleece, Thinsoulate Lining) for Winter Season.